Here is a nice review of a selection of garden variety and giant binoculars. I can see from this that my collection is clearly missing the 100 mm size. Saturday’s Airport observing saw near perfect conditions – I could have rated them ‘perfect’ but my fingers were frozen to my Bino’s (binoculars). When we setup, The Pleiades was rising in the East and when we departed some five hours later it was setting in the West. I finally understand why The Galactic Clusters in Auriga (M36, M37, M38) are called ‘Galactic Clusters’ – in wide bino’s FOV (field of view) that’s exactly what they look like. In fact M81 and M82 which are near the edge of visibility in my 10×50’s look just like the Auriga Clusters at 10x power. Scott took a closer look at these objects with the 15×70’s on a tripod and Neil gave us some close up views of The Whale Galaxy and M13 Globular Cluster in Hercules in the Big Dob. The highlight for me was looking for and finding Kemble’s Cascade – which has now been renamed (after some doughnut munching communication issues in the dark) to ‘Campbell’s Cascade’ – that familiar Scottish Cluster! In the wide bino FOV this is a striking sight, like water splashing down an invisible heavenly staircase. Just behind that in spectacle was ‘The Engagement Ring’. I have seen this on Astrophotos but normally telescopic views are too narrow field to show it. It is a string of stars joined together by The North Star Polaris which forms the Diamond in ‘The Diamond Ring’. A striking sight in wide field bino’s. Another object of note is ‘The Big S’ in Orion. Its a lazy string of stars that join Mintaka (the rightmost star in Orion’s Belt) with Alnilam (the middle star in the belt). You need a wide FOV to see this. Gary Seronik’s ‘Binocular Highlights’ proved superb for finding objects – he plots them all on an easy finder chart at the front of the book. 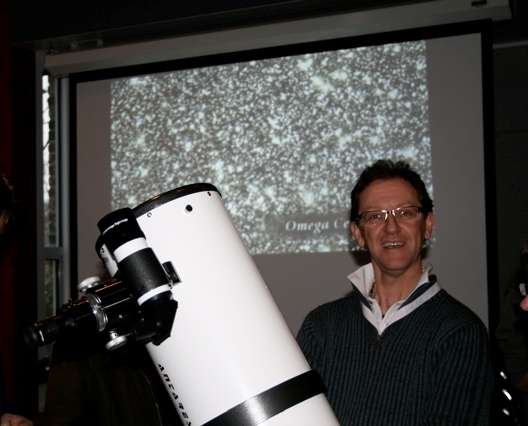 Friday’s Astro-Cafe proved a nice warm up for the main feast of Stars on Saturday night. Next outing – come early to make sure we have room at the observing site.